As you become an experienced painter you will discover various helpful painting techniques along the way. 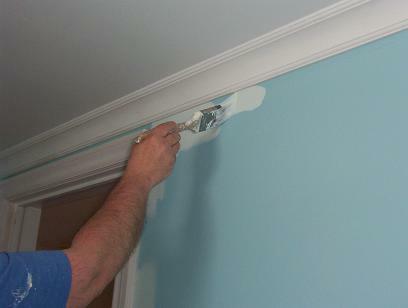 Things like when to use primers, what sheen levels to use for walls and trim, etc. There are also things like cutting in trim by hand using just a paint brush and no tape and keeping a super-sharp straight edge. These things are duck soup once you know how. As an example, I always use a high quality, two-inch angular paint brush from the paint store. Professional brushes made by companies like Wooster, Purdy, AllPro, Sherwin Williams, etc. The angular tip allows you to run a thin bead or puddle of paint along an edge of trim letting you to keep a super straight edge. This technique is like pushing a bead of hot metal when creating a weld. I made it a goal to be a good painter and paying attention to detail. I even once told a guy (whose dad was a missionary in Africa) that no matter how hard I try, there is always a "blem" somewhere in my work. He told me a story about how the Muslim people in Africa purposely put a flaw in their fabrics that they weaved on a machine because they said "only God is perfect". Because of this I no longer had to try so hard!